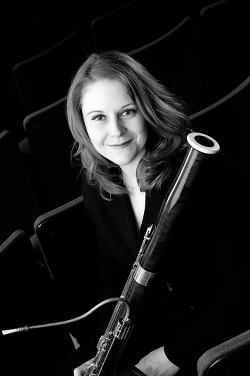 Jenny Mann is Associate Professor of Bassoon at The University of Alabama. She is also Principal Bassoonist with the Tuscaloosa Symphony and an active performer in regional orchestras and chamber ensembles. In addition to her teaching, Dr. Mann coordinates the thriving Chamber Music Program at The University of Alabama, which incorporates extensive educational outreach experiences. Dr. Mann is a member of the Cavell Reed Trio and Capstone Woodwind Quintet that perform around the country and are committed to furthering both genres through the commissioning of new works and recording. In evidence of this commitment, “The Art of Collective Invention,” a new recording by the Cavell Trio, was released in April 2012 by Blue Griffin Records. The disc includes both premiere recordings and centerpieces of the genre. It is currently available at blugriffinrecords.com, amazon.com and the iTunes music store. The trio recently completed their second recording “Dialog” to be released in April of 2014.